1. Uncle Daniel traveled to Massachusetts with his brother and his brother's wife, both died leaving him with an orphan infant to raise. 2. Young Daniel was born in England and for whatever reason he was sent to Massachusetts to live with his Uncle Daniel. 3. Young Daniel rounded off his age in his deposition, and he was older than 40 at the time, this would make him a young child rather than infant when his uncle left for Massachusetts. The only scenario I cannot picture is Uncle Daniel sailing to Massachusetts in 1638 with a baby that was not his. In his book, Thurston Genealogies, author Brown Thurston says that in an ancient document related to the militia, young Daniel's name is listed as a petitioner. Apparently someone objected to his name on the petition. The reason for the objection was that he was too young to sign a petition, he was "under his Uncle". I wish I knew what and where this document is. Brown Thurston does not say whether there was a date on the document, it would be nice to know if there was. Brown Thurston also suggested that the Thurstons might have been from either County Gloucestershire or County Kent in England. Emphasis is on the word suggested. He never said there was any proof pointed to either location. A search of the internet and ancestry.com gives varied results for his birth and ancestry. Some say he was the Daniel Thurston born 26 Oct 1628 in Faversham, Kent to Thomas and Martha Thurston. However, there is no proof that this is our Daniel. Just because you found a name and date that fits, doesn't mean it's the right one. Anyway, suffice it to say, when don't know when he was born or where. In May 1653 the General Court of Massachusetts ruled that the average Joe could not preach in public without first getting the permission of the elders from four neighboring churches or permission granted by the court. This did not sit well with Lt. Robert Pike of Newbury, who felt it was a violation of his rights as a freeman of the colony. Lt. Pike made his feelings quite clear on the matter and he was promptly brought before the court where he got a great telling off, stripped of his freeman's status and hit with a big fine. So, what does this have to do with Daniel you ask. Well, apparently Lt. Pike was a well liked and respected man, not just in Newbury but in many of the nearby towns. Petitions were written up and signed by many men asking that Pike be reinstated as a freeman and his sentence revoked. Both Daniel Thurstons signed this petition, which was presented to the court in May of 1654. If Daniel was too young to sign the militia petition, was he, in 1654 now old enough to make his opinion known and put his name to paper? And, what age was a person considered "old enough? In England and in the Massachusetts Bay Colony, the age of majority was 21. If Daniel were at least 21 in 1654 then his birth year must have been earlier than 1638, perhaps as early as 1633. I looked up a few of the names on the list of petitions, especially the "juniors" and all of them were well over 21 years of age. Hum. The court did not like having its authority questioned and interview each signer of the petition. Young Daniel Thurston was ordered to appear before the court in Nov 1654 to explain his why he signed the petition. Robert Pike's sentence was eventually dropped and he was reinstated by 1657. The court reversed its decision on public preaching by laymen in August of 1653 but went ahead with prosecution of the petitioners. The Puritans of the Massachusetts Bay Colony believed that everyone should live as a family unit. 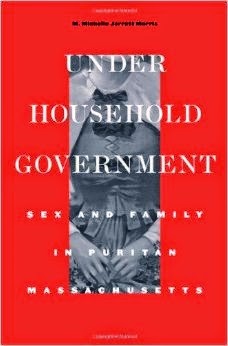 A great book on this topic is called "Under Household Government", by M. Michelle Jarrett Morris. The idea was that you lived with your family until the day you started your own, in other words, ya got hitched. Daniel married a woman named Anna Pell on 20 Oct 1655 in Newbury. This again raises the issue of his age as most men at that time did not marry until their mid-twenties. Did Daniel marry at age seventeen? Anyway, his wife is said to be from the town of Lynn. It seems that his Uncle Daniel's second wife was Mrs. Francis Lightfoot, from Lynn. Francis Lightfoot made a bequeath in his 1646 will to his brother Pell and to Hannah Pell. Was Hannah Pell the Anna Pell who Daniel married? Maybe. Ann's death is unknown, but there was a Hannah Thirston who died in Newbury on 8 Nov 1701, this could be her and Hannah/Anna were used interchangeably at that time. 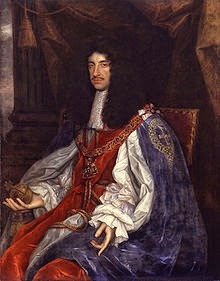 The English experiment with parliamentarian government came to an end in 1660 with Charles II restored to his throne. The Massachusetts colonists had supported the Puritan government and found themselves under royal scrutiny when Charles turned his attention to the American Colonies. The King sent commissioners to investigate the colony and apparently did not like what they found. Several of the towns, including Newbury, took it upon themselves to address a letter to the King. The letter written by the men of Newbury was a declaration of their loyalty to their "lawful prince and sovereign". Daniel Thurston signed the letter. Uncle Daniel died in Feb of 1666 and the Newbury letter seems to have been written towards the end of 1666, so it would seem that this signer was the younger Daniel. One of the commissioners complaints was that the colonist were not making the required oath of allegiance to the king. The oath was administered at various times in Newbury and Daniel and his eldest son, also Daniel, took it in 1678. Daniel and Anna had twelve children. Five died as infants or very young children. The names of the dead children were reused, in one case the name Stephen was used for three sons. All of the children were recorded in the Newbury records except Hannah, she was recorded in the Rowley town records. 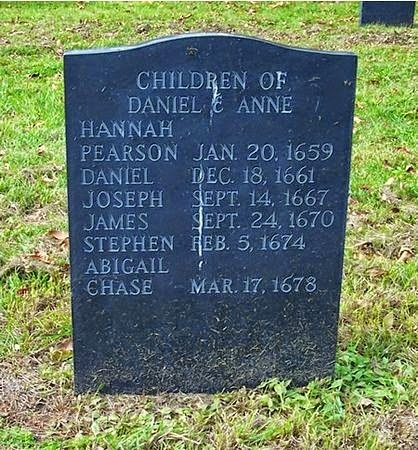 The seven children who survived childhood were each named in Daniel's will. In the late 1660's and early 1670's the church of Newbury was in a constant state of turmoil. The church membership was divided into two factions, one stood with the minster Rev. Parker and the other was against him. This issues which divided them are difficult to understand today, but at the time the minute nuances in doctrine and theology could erupt into a major battle. The Newbury problem was dragged through the courts, including the General Court. There were meetings with neighboring ministers to try to resolve the issues but the problem only seems to have really resolved itself with the death of Rev. Parker in 1677. The "covenanted" male members were named in the court records. Daniel Thurston's name was not among them so we know he was not a full member of his church and therefore we do not know on what side of this issue he stood. Daniel and his family would have been expected to attend the worship service. The service was long and sounds horribly boring but that's how they liked it. The early meeting houses were furnished with backless benches. Seating in the meeting was not a free for all, everyone had their assigned seat. This assignment was based on several factors including wealth, standing in the community, church membership, age and gender. Men and women sat on different sides, but the women were seated according to their husband's rank. This of course led to outrage and hurt feelings if they felt they were not given the rank they felt they deserved. In 1669 two Newbury men rebelled against their seat assignments and sat in other men's spots. They were taken to court and fined a whopping 27 pounds for this transgression. This may seem silly to us today, but our puritan ancestors took this business very seriously. In fact, when it was time to review the seat assignments, many men would refuse to be in charge of making the changes because they didn't want to deal with the fall out from church members unhappy with their new assignments. The other problem with the meeting houses was that they could be very uncomfortable. The members sat on wooden benches with no back or cushions. In the winter it would be bitterly cold inside. Gradually men were allowed to build pews for themselves and their wives, if they paid for them and built the pews themselves. I'm sure that Ann and her daughters appreciated the extra bit of comfort that a back support would provide. In 1675-1676 the Native Americans pushed back against the English Colonist who were squeezing them out of their traditional hunting land. Wampanoag, Nipmuck, Pocumtuck and Narragansett tribes under the leadership of Metacom, aka King Philip, attacked English settlements across New England and all but extinguished the colonies. Although there were some volunteers, many men were pressed into service. In June of 1676, Daniel Thurston was called up and he served as a mounted Trooper in Captain John Appleton's troop, under the command of Captain Thomas Prentice. The town of Newbury was not attacked during the war, but it must have been a terrifying time for them. In the nearby town of Bradford, Thomas Kimball was killed by local Indians and his family taken into captivity. At least one Newbury man was killed in the fighting and more than a dozen were injured. The economic impact from the war was huge, not only did it cost a lot of money but the damage done to towns, farms, mills, bridges etc. was significant. Just before the battle that became known as "The Great Swamp Fight" the Massachusetts government promised land grants to any man who fought in the war. After the war there was some serious foot dragging on their part and in 1683 a group of veterans sent a petition to the court requesting their land. Nothing was done. In 1727 the government finally got around to addressing the land grants and in 1733 men were finally assigned their tracts of land. Of course many of the veterans were dead by them, so the land went to the sons and grandsons of the soldiers. Daniel was assigned land in what was then Lunenburg, Maine and is not the town of Buxton. The rights to the land went to his son Daniel and his grandson John. The early American colonist worked from the instant they woke up until the went to bed. If they wanted food, they grew it. If they needed furniture they built it, if they desired new clothing, they raised the sheep, spun the wool, make the cloth and then the clothes. The nearby town of Rowley, settled by colonist from Rowley, Yorkshire who brought their skills of spinning and weaving with them. Clothing was made from cotton, flax and wool. Daniel owned two pair of looms and a spinning wheel. Looms came in different sizes depending on what material you were working with. Wool looms were the largest, linen looms were smaller and there were portable looms for making ribbons. We have no idea what type of looms Daniel owned, but he did have 24 sheep the source for wool. In 1679 Daniel acted as attorney for James Davis, Sr. of Haverhill. James died shortly after the trial, but he was suing to recover some land in Haverhill. What is interesting about this is that Jame's wife Cicely Thayer, married James Davis in Thornbury, Gloucester, one of the locations thought to be the hometown of Daniel Thurston. Was Daniel helping out a pal from the old country? It seems so, he does not act as an attorney for anyone else. Daniel's will was written on 17 Jan 1692/3 he died two days later. He mentions his wife in the will, so it's safe to assume that Ann is still alive. They are both buried in the Newbury burying ground, and each had a relatively new headstone marking their grave. one pair of sheets and a pillow ??? brass kettles and skillet and warming pan, 3 irons, pots, 2 trammells? Cubbard wooden ware cask linnen wheel and recle? Most of the items in the inventory are easily recognizable, but some are a mystery, either I don't know what they are or I don't understand the spelling. In any case it is a much more significant inventory than that of his Uncle. Beds and furniture are very valuable as are sheets and linens. Daniel does not have a lot of land at his death, but he had given some away to his sons.